Not only does the FRIGIDAIRE FAQG7011LW gas dryer look clean in Classic White but it also ensures that garments are not just outwardly clean but also sanitized. This gas dryer has earned an NSF certification as proof that it can kill 99.9% of bacteria from clothes. The clothes that have dried and cleaned also come out undamaged and wrinkle-free because of fabric-conscious features such as the Affinity Seriesí trademark DrySense technology. The FRIGIDAIRE FAQG7011LW has 6 drying cycles. Though there are only six, the basics have been covered. Plus, there is a 25-minute quick cycle. There are also enough temperature options to back up the six cycles. Included among these temperature options are the Sanitize Level and the Air Fluff. The Air Fluff temperature level does not use heat. One of the temperature levels included in the FRIGIDAIRE FAQG7011LW is the Sanitize level. At this high temperature, the appliance can kill 99.9% of bacteria found in the garments, or even within the drum as a whole. This antibacterial temperature level has earned the product an NSF certification. Precision drying is assured through the signature DrySense Technology. This technology makes the dryer thoroughly dry garments without ruining the fabric. In fact, the laundry comes out intact and even with reduced wrinkles. Though there are only a few drying cycles, options and temperature levels to consider, it would still be convenient to have the previous settings recorded. The Save Your Settings feature allows the appliance to save the last settings entered by the user. The user can access those settings if he wants the same results as before. An Affinity Series gas dryer with exact roster of features and options is available only in Classic White and Classic Black. The FRIGIDAIRE FAQG7011LW has a Classic White exterior. 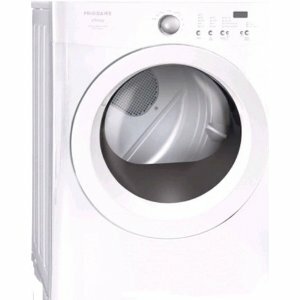 The FRIGIDAIRE FAQG7011LW gas dryer is stackable with a compatible washer. This feature enables the product to fit into even the tightest laundry areas. The control panel is found in front. It features knobs and buttons that are easy to use and manipulate but are sturdy enough to withstand frequent use. The drum has a 7.0 cubic feet capacity, which enables it to accommodate the heaviest loads. It is made of painted steel, which makes it strong and rust-free and thus able to last for a long time. The appliance is easy to use, because of push button controls. The FRIGIDAIRE FAQG7011LW is NSF certified. Fabric care is emphasized in this product through the DrySense Technology. The garments come out wrinkle-free. This saves time as the user does not have to exert so much effort on ironing. Previous settings are automatically saved. The FRIGIDAIRE FAQG7011LW saves space by being stackable with a matching washer. The product does not have an Energy Star rating. The use of gas may not be allowed in some apartment buildings.